During the Olympics, many nations have taken the chance to build their own 'houses' during the two weeks of the games. These houses give the public a chance to experience a little of the culture that all the different countries have to offer, and South Korea has set up their own house in Knightsbridge at the Royal Thames Yacht Club. 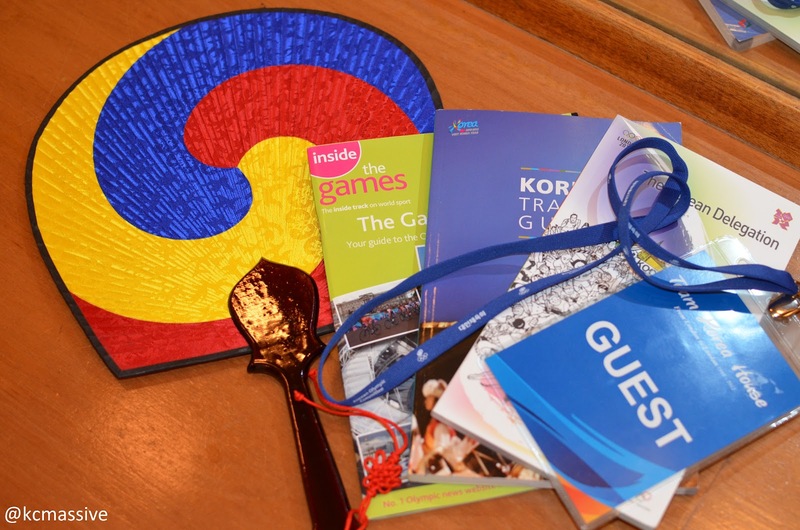 Korea House, which is open each day from 10am - 6pm during the Olympics, has a range of cultural activities happening all day, with special shows scheduled at certain times in the day. Entry is free, which is always good, and there are chances to pick up lots of interesting information and guides to Korea while you're there. When we arrived there was quite a queue outside to get in. There are strict security checks in place, so depending on the time and day, you might have to wait a while to get in. We timed our arrival to coincide with the first special show of the day. As we hadn't checked ahead what the show would be, we were quite surprised to find out that we were about to watch a magic show! After a short yet epic introduction (by the man himself), we were greeted by the magician, JK! 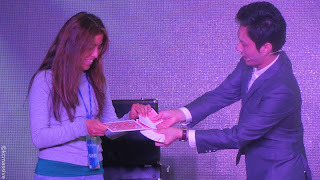 JK is probably the cheesiest but funniest magician out there. 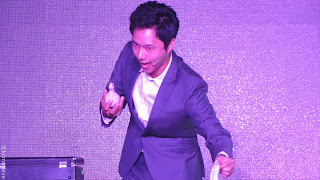 He started his show by purposefully messing up his tricks for laughs, or revealing his cheats which was hilarious. He had some really original ideas and lines, engaging the audience the whole way through his performance. Some choice lines he came out with were things like "I can do any magic you want, what magic do you want to see? *a difficult trick was suggested* Sorry, I don't understand what you are saying because I am Korean. Levitation you say? There's always technical difficulties with that one - something I call gravity". As usual, there was the 'eyes to the floor' moment when he asked for volunteers, but some brave people came forward. One girl who volunteered possibly later regretted her decision as she ended up pulling a trail of tissue from JK's mouth and told to keep it as a souvenir... 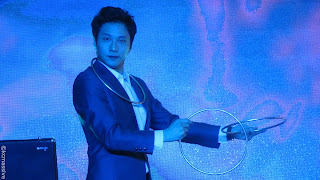 The magic routine wasn't the most amazing we've ever seen, but mesmerising nonetheless and the charming charisma and comedy of JK made up for it. The show is definitely worth catching for the amount of cheese and giggles we got out of it, and we're sure anyone who goes along with get a good chuckle out of it too. When this finished, we rushed down to see the dancing robot show! These cute, lit-up robots were dancing in-sync to many Kpop hits starting with the iconic 'Abracadabra', 'Sorry sorry' and ending with a 'Fantastic Baby' (of course). The robots' dancing was so energetic, one of the people working at Korea House had to keep a close eye on them to make sure they don't fall over. This display was really popular with kids and adults alike! Apart from the scheduled shows, there are activities on offer throughout the day. 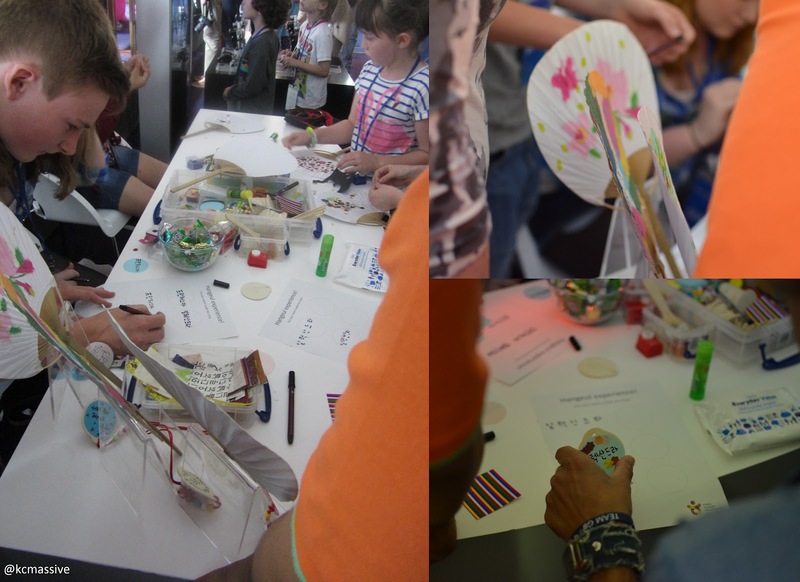 There is a crafts area, where people were learning how to write their name in Hangul and decorating their own fans. There was also a very popular hand massage area, where you could try out these high tech massaging machines. And if that wasn't pampering enough, there was a lady giving out beauty and skin care advice. You could also take photos in Hanboks with a nice little scenic backdrop and take home a polaroid souvenir! There were several different outfits available for men and women, and was very popular with couples. There was also a touch screen computer where you could select some Kpop tunes to play. We're pretty sure everyone was impressed with our choice of Girls' Day and Dal Shabet. If you're planning to go to Korea any time soon, Korea house is really worth a visit as there were some great information packs available to take home with you. These included a tourist map of Korea, a Korean Travel Guide, as well as more general booklets about Korean food and culture. One area of Korea House was set aside to help promote the 2018 Winter Olympics in Pyeongchang. There was some great displays and lots of information for you if you're planning to travel to this event! If you want to head over to Korea House, and we recommend you do, the location is the Royal Thames Yacht Club, 60 Knightsbridge. It's just near Knightsbridge tube, and is super easy to locate. If you want to see a show, make sure you get there a bit earlier to secure your ticket. Many thanks to my friends over at Korean Class Massive for granting me permission to re-post this wonderfully informative article! They always make me feel like I've been there in person.